CineCzarina Film & TV News and Reviews: Response Editorial - Do the Golden Globes Matter? I read an article today that questioned the importance of the Golden Globe award, an honor awarded by the Hollywood Foreign Press Association for achievements in film and television. Since their inception in 1944, the honors bestowed by the HFPA have not only served to recognize extraordinary contributions to entertainment, but have served a greater purpose through the proceeds accumulated from its broadcasts in the form of numerous charities, programs and scholarships. Where this particular award show really succeeds, however, is in his format. It's a party! Where dramatic, comedic, musical, film, and television performers converge, drink champagne and rub elbows. Actors who otherwise would never be in the same film are suddenly in the same room, laughing, congratulating and networking the night away - and we, the audience get to enjoy it all without filler and superfluous hosts. Instead, the arena is resplendent, the mood is casual and best of all, it all takes less than 3 hours (lately, anyway). Another plus of the Globes is the adulation placed upon films and performances that may otherwise have been ignored. The presence of comedy film and acting categories is something singular to the Golden Globes. It's wonderful to see credible, entertaining fare get the attention its deserves, especially knowing how all the others high-profile awards make no such effort. More importantly, there is leverage to be gained by vindication from the HFPA, whose body is composed of critics from around the world, not just the US. And we are not the only one's whose opinion matters. Mostly, the Globes serve as an important precursor - a critical barometer of how shows, films and performers have been perceived to this point. For viewers still trying to decide what's worth their time and money, being well received at the Globes helps with the decision-making process. For Academy voters, as well -if they've been waffling between films, its justification for a choice they've been mulling over. Perhaps they come away knowing better what choice to fill in on the ballot. In the end, what's important to remember about awards season is the splendor and history that are made. Some actors and films find their voices and begin a journey to greatness. Others..get a reality check and come to appreciate what little honor finds them knowing its fleeting. 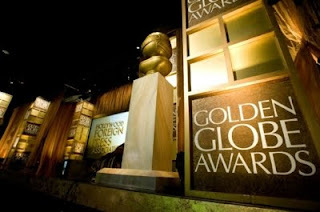 But, at least at the Golden Globes, its all about the spotlight for a night.